Desperate Rohingya Granted Temporary Shelter. But What Next? : Parallels Malaysia and Indonesia will allow migrants stranded at sea to come ashore. But it's a one-year, one-off deal, with no signs the flow of the Muslim minority fleeing persecution in Myanmar will stop. A fishing boat carrying Rohingya and Bangladeshi migrants is pulled to shore by Achenese fishermen off the coast of Julok, in Indonesia's Aceh province, on Wednesday. The governments of Indonesia and Malaysia agreed Wednesday to allow boats full of thousands of migrants stranded at sea to come ashore. The news came as Indonesian fishermen rescued more than 400 people from a boat that first made the news last week — and finally got governments to act. Found by two boatloads of journalists late last week, the ship had hundreds of desperate men, women and children packed aboard. The captain and crew were missing. The Thai navy had been the first to arrive. It distributed food and water to those on board — some by hand, some dropped by helicopter into the water, where dozens of men from the boat instantly jumped in to retrieve it. Onboard, there were scuffles over the food. The passengers said they'd been at sea for four months — migrants from Bangladesh and members of Myanmar's Muslim minority Rohingya, fleeing persecution by the country's Buddhist majority. An Indonesian official takes the photo of a newly arrived migrant for registration purposes before he goes to a temporary shelter, in Simpang Tiga, Indonesia, on Wednesday. After giving out supplies and fixing the boat's engine, the Thai navy towed it into international waters. Lt. Cmdr. Weerapong Nakprasit of the Thai navy said he could do no more. "We looked after their basic humanitarian needs, but the most important thing for us is our own security," he said. "If they come into our waters, they're breaking the law as illegal migrants." The ship had been turned away twice before: by the Malaysian and Indonesian navies. The migrants are still illegal migrants, though the governments of Indonesia and Malaysia said Wednesday that they would accept the migrants currently at sea — an estimated 7,000 people. But both governments insisted the offer was a one-off, and that more aren't welcome. Thailand isn't part of this agreement. And it doesn't mean the migrants will stop coming — in part because Myanmar's government doesn't want them to stop. 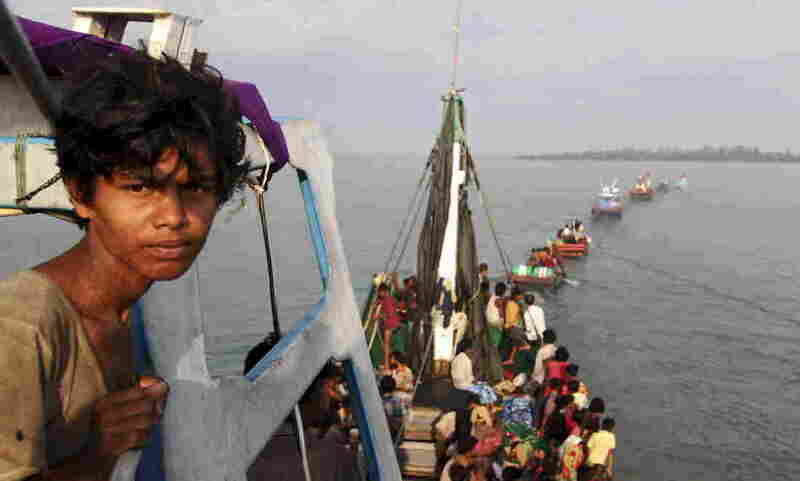 "We've actually documented the Myanmar navy towing boats out to sea to send them on their way to Thailand and Malaysia," says Amy Smith, executive director of the human rights NGO Fortify Rights. "This is something they're complicit in. We know that they're receiving money from the traffickers, so they're very much in bed with the trafficking networks," Smith says. "They're getting rid of a population they feel isn't supposed to be in their country, and they're making money off of it." Abu Talet is a 50-year-old Rohingya who fled Myanmar and escaped from his captors after his boat landed in southern Thailand. In Myanmar, he says he felt like "a prisoner in my own home. I never knew when they would come for me." Despite Wednesday's agreement, there is no guarantee the migrants will be able to make it without adequate supplies, on boats where conditions are often beyond brutal. Mohamad Nasi, a 13-year-old Rohingya, was on one of the last boats to arrive in Thailand before authorities cracked down. He escaped from his traffickers, and has been living in Thailand for a little more than a month. He has a nasty story about his experience at sea. "While we were on the boat they kept us below deck. When we asked for water, they didn't give it to us. And the guards beat us, and some people died from those beatings," he says. "Many died because it was very hot underneath the decks. We asked them to throw the bodies overboard because of the smell, but the guards just said, 'Wait, there will be more. Then we'll throw them all out together.' "
Abu Talet is a 50-year-old Rohingya who also managed to escape his captors, who were holding him on the island of Lipe in southern Thailand after his boat landed, a place not far from where the graves of more than two dozen migrants were discovered more than two weeks ago. He says he was a teacher at one of the displacement camps in Myanmar's Rakhine state for Rohingya forced to flee the last few years of violence. But Abu Talet says he left because of harassment by Burmese officials. In Lipe, he lives in a one-room shack and it's bleak. He doesn't speak the language, can't teach anymore, can't make enough money to bring his wife and family — but still thinks he had no choice but to leave. "There, I was a prisoner in my own home," he says. "I never knew when they would come for me. Now that I'm here, I know they can't get at me — and won't bother my family." And that's why more are likely to come. The Rohingya — stateless in Myanmar and not recognized as citizens by the Burmese government — do not feel safe there anymore. "The situation in the displacement camps, where most of them are staying, [has] so deteriorated that they really have no option to stay anymore," says Smith of Fortify Rights. "They're lacking basic humanitarian needs — food, medical care. This is a situation that really can't continue, it has to be addressed, and it has to be addressed in Myanmar. That's the root cause." A spokesman for Myanmar's president insisted last week that his country is not the "source of the problem" and hinted Myanmar might not attend a regional summit next week in Bangkok if the word "Rohingya" is used. They now seem to be reconsidering.